Example One: Lost all photos on your computer after the system reinstallation or upgrade, and you wish to copy them from your iPad Air to Mac for editing in iPhoto or Photoshop? Example Two: Love to take photos with your iPhone X, so saved lots of precious photos on the device after a period of time. In order to release more free space on the device, you need to backup these photos from iPhone X to Mac computer with one click? We all know that iTunes is a good media management tool on the desktop computer. And it can help you import photos from computer to iPhone Xs, iPhone Xs Max, iPhone XR, X, 8 Plus, etc. within a few clicks. But if you wish to export the iPhone pictures to Mac computer for backing up, editing or sharing, things could be a little bit different due to the Apple's security consideration. So in this page, we could like to recommend all of you with 3 different ways to transfer photos from iPhone to Mac. If you're struck in any situation above and want to copy/move iPhone pictures to MacBook Pro, MacBook Air or iMac, etc., then you can find an ideal solution to deal with your problem in the following contents. Below is the primary window and the detailed steps of the best iPhone Photo Transfer program. Step 1. Connect iPhone to computer with USB cable, and launch the iPhone Photo Transfer program. Click "Trust" button to trust this computer on your iPhone, then you'll see the above interface on your computer. Step 2. Click "Photos" in the left panel and preview all pictures in the program, then find your target images and tick them one by one. Step 3. 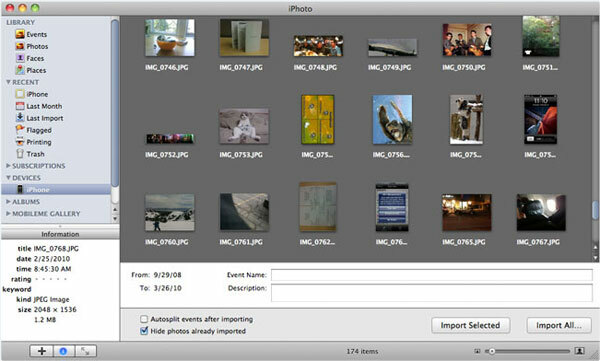 Hit "Export" button to start transferring photos from iPhone to Mac. Step 1. Directly connect your iPhone Xs, Xs Max, XR, X, 8 Plus, 8, etc. to Mac, and then iPhoto will automatically launch and open to the Import window. All photos taken with iPhone will be listed under "Camera Roll". Step 2. Click "Import All..." button to load all iPhone photos to iPhoto with one click. If you only need to import few files, you can click "Import Selected" button as you like. Only two simple steps, you can copy pictures from iPhone to Mac's iPhoto easily, and you can preview or edit the images with iPhoto as you like. If you only have few images need to be exported to Mac computer for sharing or backup, you can use the Email service on your iPhone. You only need to open the photo app on the device, and find the photos you want to send. Tap "Select" button on the top right corner and mark the pictures you wish to transfer. After that, you can click Share and choose Mail function to send the images to your desktop computer easily. However, using email to send photos have number limited, you only allowed to send up to 5 pictures in one email. So if you have a large amount of photos should be transferred, this method could be time-consuming. And it is required the network situation is normal. Otherwise, you can't use the Mail service. Comparison: Which One is Better? 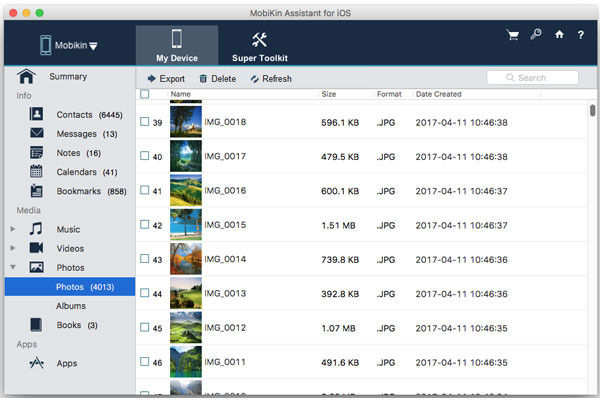 After reviewing these 3 methods on transferring photos from iPhone to Mac, we can easily find that the first method could be the best one. Because it can transfer all photos or images on your iPhone devices to Mac computer with one simple click, and it also can help you manage other files on your device very well. 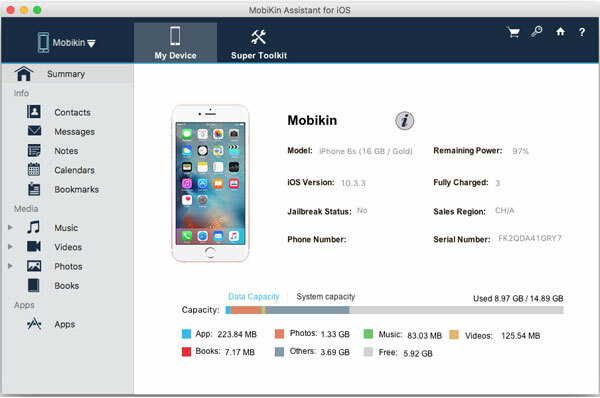 Thus, if you're looking for a comprehensive program to deal with your iPhone photo problem, then you can't miss MobiKin iPhone to Mac Transfer any more. How to Transfer Video from iPhone to Computer? How to Transfer Music from iPhone to Mac? How to Transfer/Sync Music from iPhone to iTunes?